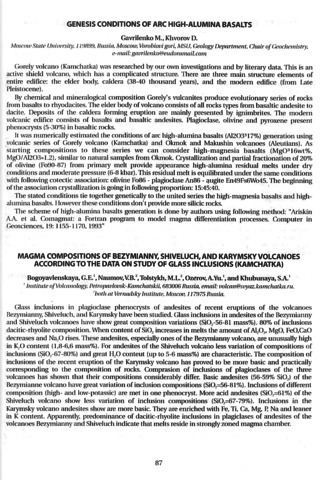 This paper describes catastrophic eruptions of Mount St. Helens (1980), Bezymianny (1955–1956), and Shiveluch (1964) volcanoes. A detailed description of eruption stages and their products, as well as the quantitative characteristics of the eruptive process are given. The eruptions under study belong to the directed-blast type. This type is characterized by the catastrophic character of the climatic stage during which a directed blast, accompanied by edifice destruction, the profound ejection of juvenile pyroclastics and the formation of pyroclastic flows, occur. The climatic stage of all three eruptions has similar characteristics, such as duration, kinetic energy of blast (10^17−10^18 J), the initial velocity of debris ejection, morphology and size of newly-formed craters. But there are also certain differences. At Mount St. Helens the directed blast was preceeded by failure of the edifice and these events produced separable deposits, namely debris avalanche and directed blast deposits which are composed of different materials and have different volumes, thickness and distribution. At Bezymianny, failure did not precede the blast and the whole mass of debris of the old edifice was outburst only by blast. The resulting deposits, represented by the directed blast agglomerate and sand facies, have characteristics of both the debris avalanche and the blast deposit at Mount St. Helens. At Shiveluch directed-blast deposits are represented only by the directed-blast agglomerate; the directed-blast sand facies, or blast proper, seen at Mount St. Helens is absent. During the period of Plinian activity, the total volumes of juvenile material erupted at Mount St. Helens and at Besymianny were roughly comparable and exceeded the volume of juvenile material erupted at Shiveluch, However, the volume of pyroclastic-flow deposits erupted at Mount St. Helens was much less. The heat energy of all three eruptions is comparable: 1.3 × 10^18, 3.8−4.8 × 10^18 and 1 × 10^17 J for Shiveluch, Bezymianny, and Mount St. Helens, respectively. Bogoyavlenskaya G.E., Girina O.A. 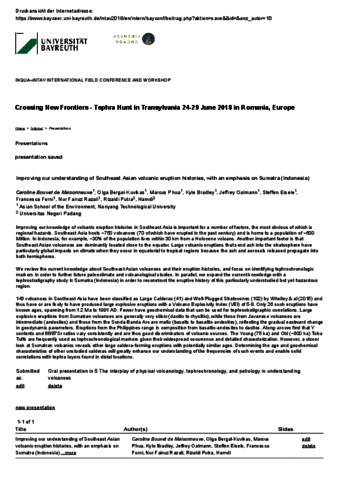 Bezymianny volcano: 50 years of activity // Abstracts. 5rd Biennial Workshop on Subduction Processes emphasizing the Japan-Kurile-Kamchatka-Aleutian Arcs (JKASP-5). 2006. P. 129 doi: P 601. Bogoyavlenskaya G.E., Kirsanov I.T., Firstov P.P., Girina O.A. Bezymianny (Kamchatka). 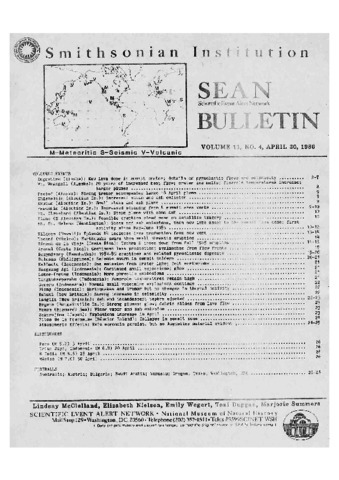 1984-1985 eruptions and related pyroclastic deposits // SEAN Bulletin. 1986. № 4. P. 15-20. The temperature and hydrogen isotope composition of the fumarolic gases have been studied at Kudriavy volcano, Kurile Islands, which is unique for investigating the processes of magma degassing because of the occurrence of numerous easily accessible fumaroles with a temperature range of 100–940°C. There are several local fumarolic fields with a total surface area of about 2600 m2 within the flattened crater of 200×600 m. Each fumarolic field is characterized by the occurrence of high- and low-temperature fumaroles with high gas discharges and steaming areas with lower temperatures. We have studied the thermal budget of the Kudriavy fumarolic system on the basis of the quantitative dependences of the hydrogen isotope ratio (D/H) and tritium concentration on the temperature of fumarolic gases and compared them with the calculated heat balance of mixing between hot magmatic gas and cold meteoric water. Hydrogen isotope composition (δD and 3H) shows a well expressed correlation with the gas temperature. Since D/H ratio and 3H are good indicators of water sources in volcanic areas, it suggests that the thermal budget of the fumarolic system is mostly controlled by the admixing of meteoric waters to magmatic gases. The convective mechanism of heat transfer in the hydrothermal system governs the maximum temperatures of local fumaroles and fumarolic fields. Low-temperature fumaroles at Kudriavy are thermally buffered by the boiling processes of meteoric waters in the mixing zone at pressures of 3–12 bar. These values may correspond to the hydrostatic pressure of water columns about 30–120 m in height in the volcanic edifice and hence to the depth of a mixing/boiling zone. Conductive heat transfer is governed by conductive heat exchange between gases and country rocks and appears to be responsible for the temperature distribution around a local fumarolic vent. The temperature and pressure of shallow degassing magma are estimated to be 1050°C and 2–3 bar, respectively. The length of the ‘main’ fumarolic gas conduit is estimated to be about 80 m from the linear correlation between maximal temperatures of fumarolic fields and distances to the highest-temperature ‘F-940’ fumarole. This value may correspond to the depth of an apical part of the magmatic chamber. 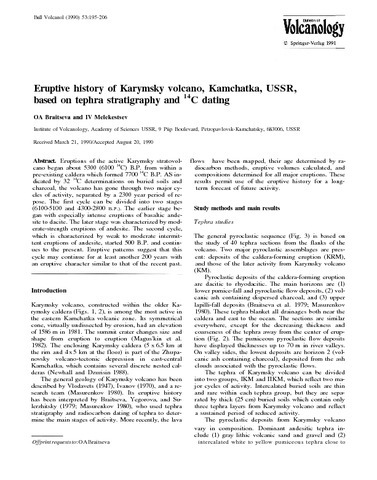 The geometry of the crater zone at the Kudriavy summit and the model of convective gas cooling suggest different hydrostatic pressures in the hydrothermal system at the base of high- and low-temperature gas conduits. The depths of gas sources for low-temperature fumaroles are evaluated to be about 200 m at the periphery of the magma chamber. Bouvet De Maisonneuve Caroline, Bergal-Kuvikas Olga, Phua Marcus, Bradley Kyle, Oalmann Jeffrey, Eisele Steffen, Forni Francesca, Fairuz Razali Nur, Rizaldi Putra, Rifai Hamdi Improving our understanding of Southeast Asian volcanic eruption histories, with an emphasis on Sumatra (Indonesia) // Crossing New Frontiers - Tephra Hunt in Transylvania 24-29 June 2018 in Romania, Europe. 2018. The chronology, dynamics, and parameters of seven large eruptions of Avacha Volcano were reconstructed for its IAv andesitic period 7250-370014C years B.P., which began after a >2000-year period of relative quiescence. Their juvenile (andesitic pyroclastics) and resurgent products are described, and the geological and geomorphological consequences are evaluated. The largest eruption occurred 715014C years B.P. (8-10 km3 of erupted material). The subsequent events occurred 5700 (≥0.34 km3), 5600 (≥0.4 km3), 5500 (>1.34 km3), 5000 (≥0.5 km3), 4500 (>1.1 km3), and 4000 (≥0.6 km3) 14C years B.P. The erupted rocks were dominated by tephra; pyroclastic flows occurred only during the events of 5500 and 5000 years ago. It is believed that most of the eruptions produced acid peaks of varying intensity in the Greenland ice sheet. Eruptions of the active Karymsky stratovolcano began about 5300 (6100 C-14) B.P. from within a pre-existing caldera which formed 7700 C-14 B.P. As indicated by 32 C-14 determinations on buried soils and charcoal, the volcano has gone through two major cycles of activity, separated by a 2300 year period of repose. The first cycle can be divided into two stages (6100-5100 and 4300-2800 B.P.). The earlier stage began with especially intense eruptions of basaltic andesite to dacite. The later stage was characterized by moderate-strength eruptions of andesite. The second cycle, which is characterized by weak to moderate intermittent eruptions of andesite, started 500 B.P. and continues to the present. Eruptive patterns suggest that this cycle may continue for at least another 200 years with an eruptive character similar to that of the recent past.